In 1994 when my ex–wife Auriol and I bought ‘Graingers’ we were already collaborating as The Lawson Baker Partnership, producing corporate sculpture in our own studio. Our works were often enlarged in Paris by Robert Haligon whose grandfather had worked with Rodin as a plaster moulder. Casting in Bronze was done by Burleighfield just off the M40 on the road to High Wycombe, where the three directors had branched out to create a new foundry after working for many years at Morris Singer in Basingstoke. Eric Gibbard ran the business with Ted Knell overseeing the foundry and Dennis Ball, the finances. They had already had an interesting career casting most of Barbara Hepworth’s bronzes after 1952. They also worked with Elizabeth Frink, Chadwick, Armitage, all of whom I met in their foundry, together with a host of other well known names from the world of sculpture. One day in the early 90’s with Auriol driving our old Range Rover, I was playing with a ball of wax while sitting beside her in the passenger seat with our son Tom in the baby seat behind us. 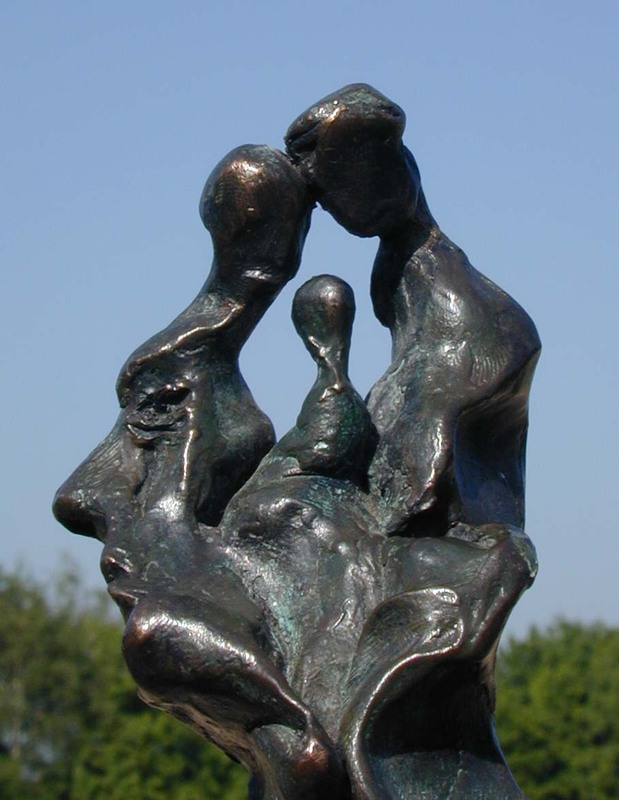 After a while I suddenly saw an interesting shape appearing as if the wax had formed itself into a small human head with man, woman and child erupting from it, as a family. I showed Auriol. We were both amazed and rather liked it. It was us with our babe! Eventually I had this small wax moulded and a bronze cast made. It was about 14cm high x 8cm wide and 7cm deep and was patinated green/black and waxed. For years it has sat in my studio and I often thought of that moment when it suddenly appeared in my hands as if by divine intervention. Interestingly enough I often start sculpting with no particular intent, looking for inspiration and the wax and some other power seem to just direct me and tell me what to do. Now some 25 years later, in 2015, I have decided to enlarge that small maquette and have initially had a cast made in bronze at The Morris Singer foundry in Basingstoke at 44cm high x 24cm width x 21cm deep. The next step is to take a deep breath and make a heroic work of ‘ Tete de Famille’ at, say, four times that size. The work to produce it is huge and the expense enormous but it will be a strong statement.